Christopher G. Hill is lawyer and owner of the Richmond, VA firm, The Law Office of Christopher G. Hill, PC, and a LEED AP. Chris has been nominated and elected by his peers to Virginia’s Legal Elite in the Construction Law category on multiple occasions. He specializes in mechanic’s liens, contract review and consulting, occupational safety issues (VOSH and OSHA), and risk management for construction professionals. Chris authors the Construction Law Musings blog where he discusses legal and policy issues relevant to construction professionals. Additionally, Chris is active in the Associated General Contractors of Virginia and the Board of Governors of Construction Law and Public Contracts Section of the Virginia State Bar. 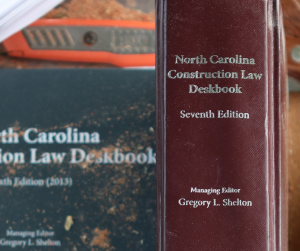 First of all, thanks to Greg for the chance to post here at Construction Law Carolinas. I’m always happy to post with friends and truly appreciate the opportunity. Over the past several weeks, several developments have occurred in the land of green building. The International Green Construction Code or IGCC (2.0) was introduced at Green Build to much debate and acclaim. As pointed out by my friend and fellow LEED AP construction attorney, Doug Reiser in his Builder’s Counsel Blog, several states and municipalities have adopted this construction code. Whether you agree or disagree with this move, it is time to get educated on this development and how it could affect your business going forward. To do so, check out the webinar and audio at Chris Cheatham’s Green Building Law Update for some great analysis. Chris also has a series of articles analyzing the IGCC that are worth a read. New green building projects are popping up all over the place. The USGBC, the entity that oversees and implements the LEED certification program, estimates that it has 1 billion (yes with a “b”) in square footage within the LEED system. The General Services Administration of the Federal Government has mandated green building in all new construction. Couple that with the adoption of “green” zoning regulations (such as in Arlington, VA) and state “green” building codes (such as CALGreen), and you, as a builder or construction professional (read attorney) have every reason to believe that sustainable building is here to stay. However, the news is not all rosy. The issues with some high profile “green” projects (some green building related, and others merely run of the mill construction disputes in green clothing), are enough for even the most optimistic of us to wonder about the future of green building. While I have on several occasions compared myself to Eeyore, the ever rained upon donkey and friend of Winnie the Pooh, when it comes to my outlook on the future of sustainable design and building, I, like Eeyore, keep plugging along, and so should you. Despite some setbacks (some of which could have been avoided through proper planning), the sky is not falling on green building. My fellow attorneys in the construction field along with our clients need to learn from these issues in order to avoid them. One trend that I see continuing, aside from the move toward more sustainable building practices, is the rise in legal, contractual and insurance/bond related risk management consulting. With the proper teams in place, the issues raised above can be minimized. In short, the trend is very much toward a sustainable building infrastructure. We’re all in for quite a ride and should not be discouraged by the occasional hiccup. This move toward a more energy efficient and environmentally friendly building stock is a good one that needs to continue, we just can’t fly blind into that good night.